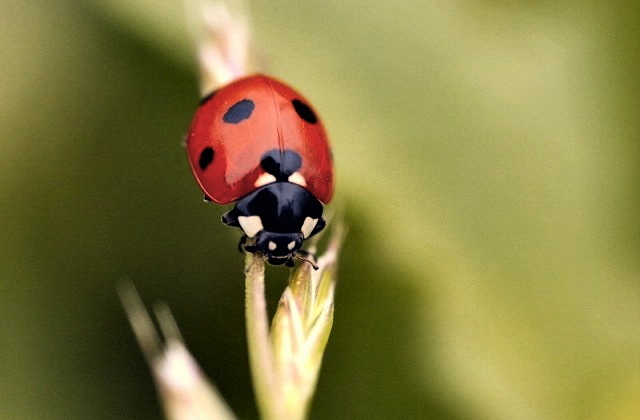 Traditionally speaking, most want to rid their garden of bugs - An exception should be made for ladybugs, which actually act as an efficient and organic alternative to commercial pesticides. Ladybugs feast on pests notoriously harmful to your plants; primarily aphids, mealybugs, leaf hoppers, scales and mites. They also seek pollen sources and are easily attracted if you plant a few key species along your regular garden routine; flowers and herbs such as cilantro, dill, fennel, caraway, yarrow, tansy, angelica, scented geraniums, coreopsis and cosmos are good choices for luring the ladybug. A step further to insure you keep these little gardeners around is to create a simple feeder for them; typically, a large, hollow bamboo tube is used. The bamboo should be placed close to the plants or areas you are trying to protect, filled with small twigs or cane and maintained with raisins for the ladybugs to feed on when insects are scarce. When you're finished, stick the habitat in your garden on a stone or ledge. The ladybugs will make nests inside the habitat's hollow spaces -- and watch over your garden.